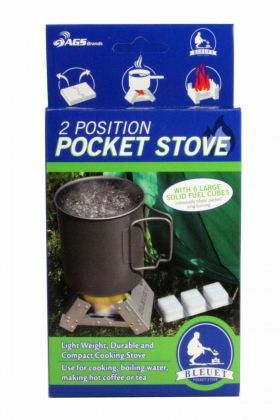 Excellent folding pocket stove for your pack. Includes 6 large solid fuel cubes! Each cube will burn for about 15 minutes giving you plenty of time to boil water or cook your food. This is a very lightweight stove you can take anywhere and not be concerned how much it weighs. Or how much space it takes up. Folded up, it is only a little bit larger than a pack of cigarettes. 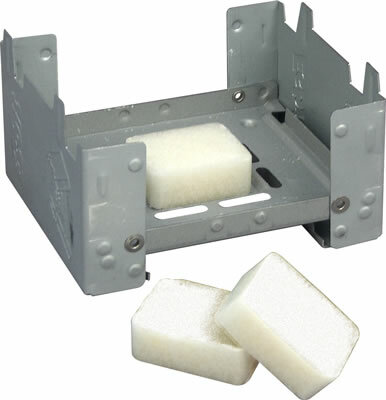 COMPACT 3" X 4" X 3/4"
No need to build a fire when all you need is a little bit of time to get your food warmed up. This little stove provides a platform for you to place your cup or cooking pot on. You just light the fuel cube and you have instant heat that lasts up to 15 minutes. Should you need more time, you can use another cube to continue cooking. If you just need to boil some water for a cup of coffee or tea, then this camping stove is all you need. When you're finished, it folds back down to easily slip inside your pack, ready to go for the next time. This a perfect combination of a small efficient portable and foldable solid fuel stove and its solid fuel. I got that one but eventually discarded it for the stove that was designed to fit the canteen cup of the US military canteen....It made more sense for compatibility purpose. But this stove is also awesome.